Hi. 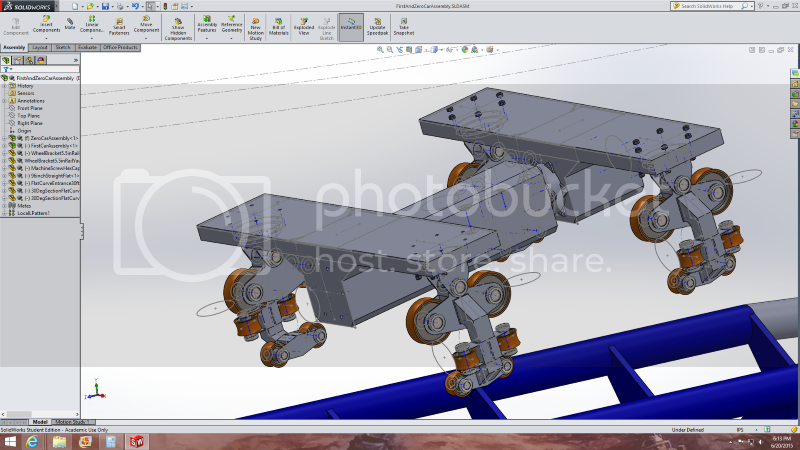 I'm taking a course in Solidworks 2014 and I got far enough ahead that I started messing around. I'm making a roller coaster train and I would like to have the wheels follow a complex path. I have created the assemblies for the first two segments of the car and applied mates to them so that all of the joints for pivoting are present, just like on a real roller coaster. The track is where things get quite a bit more complicated. I've been messing around with a few different methods of creating the shapes needed to properly represent a track. For the current method, I made a sketch with a reference point to show where the rider's heart line would be. Then, I made a curve and did a sweep with a twist to get banking. Because of how I created the sketch with the heart line, the track will roll around the rider instead of the rider rolling around the track. I have been toying with whether to make the whole track as one part or to make it out of multiple parts (like on a real track). As in, divide the length of the track into the segments that would then be bolted together on site. 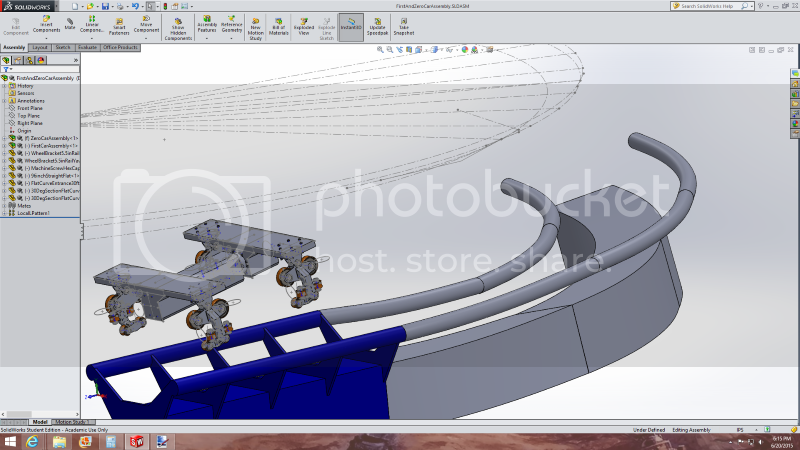 Now, the tricky part is I need a way to make my wheels follow the track through the complex path across multiple parts. I figure it will have something to do with reference curves and/or motion paths, but I'm having a hard time finding exactly the kinds of tutorials I need. S&S power uses SW to make their coasters, so I know there must be a way to make this work. I attached the entire crazy file directory for the project. The file shown in the pictures is FirstAndZeroCarAssembly. Thanks in advance for any help.